Ambient electronica, as the name implies, is a genre that demands scale over scope. Brian Eno’s gift to music has had a rather uneven history, mostly owing to the fact that it’s extremely difficult to get right without tottering into either instrumental overload or the dubious lure of world music. Furthermore, as technology advances with the times, the detail demanded during the analog days of electronica is often passed over in favor of letting the machines just do their thing. Nicolas Fromageau and Anthony Gonzales, better known as M83, are able to incorporate the souls of woeful balladeers into a highly micro-analyzed take on ambient electronica. On their fourth album, Digital Shades [Vol. 1], the band unleashes a swirling sensory experience of futuristic sights and sounds rather than an exercise in virtuosity. M83 is more shoegaze than conventional electronica, incorporating a marriage of distorted instrumental effects with ripe artificial foundations of tones. The tempos are slowed and the mood is reigned into atmospherics over energy, much like Mogwai pioneered ten years ago with their groundbreaking album, Young Team. 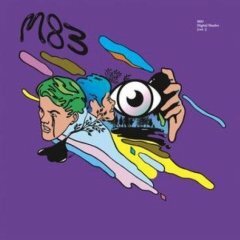 There are answers in the ambience, if one knows where to look, and M83 paints a vivid connect-the-dots on this disc. The album’s most potent punch is the duo’s ability to evoke feeling and imagery without reliance on words. The timeless themes of uncertainty and loss undeniably seep through the tempered layers and give Digital Shades [Vol. 1] a gravity that envelopes the ears. Whether or not M83 intends it, each song draws sorrow out of the listener’s body, like venom from a ripped wound. It’s a morose catharsis that reflects the cold chemical answers that our current and future civilizations look to for aid. From the grave-digging piano on “Dancing Mountains” to the quavering, string-like synthesizer on “My Own Strange Path,” each addition to the shadowy whole is worth its weight in gold. The keys on the closing “The Highest Journey” seem to shove harder after each bar as the funeral parade of ambience starts to invade the soundscape. During the course of what sounds like a polished extension of Sonic Youth’s “Providence,” scathing flares of static carry the ghostly voices forward in their dirge. Hauntingly gorgeous in its simplicity, and emotionally direct as a dying friend, it’s a summation of the album’s triumph of mood. Digital Shades [Vol. 1], like Caribou’s Andorra, demonstrates that there are still worlds yet to be uncovered in the cold architecture of electronic music. Let’s hope there’s a volume 2.
great review, but this M83 record is a solo project by Anthony Gonzalez only. Most of the reviews gives 5-6 out of 10, i just dont understand….boo!